Parental Appeal to Stop Daycare Chick Hatching Project Succeeds! Hello UPC. I wanted to write and tell you about a victory for chickens! I have two children ages 3 and 2. They attend the same daycare. The daycare gives out a newsletter once a month with information including upcoming events. Last month’s issue touted a "special surprise" in store for the kids in April. 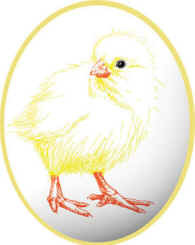 If you haven't guessed, that "surprise" was to have an egg incubator in the daycare for a week to watch the eggs hatch. My husband and I were outraged! I explained to the daycare teachers, and my husband Chris McGarry explained to the Director of the Daycare, that this chick-hatching project goes against our beliefs. It sends the wrong message to kids, since these chicks would certainly be sent off to slaughter afterward, and there are other ways to expose children to animals and teach humane animal care. This wasn't the way to do it! We appealed to them to cancel the project or at least let us place the chicks afterward. We were told it was too late and that we couldn't place the chicks because it was specified in the contract that the chicks would have to be returned to the vendor. I felt defeated as an animal advocate and parent. However, the Director of the Daycare had a change of heart because she told me last Thursday that she thought about what we had said and canceled the project! My husband and I are going to set up a Humane Education Day with them too. We thought you'd appreciate hearing about our victory for chickens instead another sad story of their misery and defeat. We are delighted to bring you Renee’s great story – a victory for the chickens, a victory for humane education, and a victory for effective animal advocacy. To learn more about humane alternatives to classroom chick-hatching projects and what you can do, please visit www.upc-online.org/hatching. And please do a Compassionate Action for Chickens in May for International Respect for Chickens Day May 4. May is International Respect for Chickens Month. Please make every day Respect for Chickens Day, and get others to join you. Find information about International Respect for Chickens Day.